Tempo & Tension Maximization For Advanced Bodybuilders! The body will adapt to any training regimen in time, so tempo prescriptions should be varied just like any other training variable. It can help you! When you just start in bodybuilding, finding ways to overload your muscles and increase intensity is easy. Frankly, everything is an overload to a beginner. As you get more advanced, it becomes more challenging to continue the upward progression. It's more or less universally agreed that the most effective method of progressive overload is adding weight. If you're preparing for competition, you often have to look for different ways to intensify your workouts because adding weight with the stress of daily cardio, low carb dieting and sub- maintenance calories is easier said than done. Besides, pushing for personal strength records all year round without cycling intensity can lead to injuries. So how do you continue to shock your muscles and increase the intensity of your workouts without adding weight? Easy—you make the same weight feel heavier with tempo and tension manipulation. Open up any book about bodybuilding, and it will emphasize the importance of rep speed, also known as "tempo." Specifically, tempo means how quickly you lift a weight (the concentric part of the rep, also known as the "positive") and how quickly you lower the weight (the eccentric part of the rep, also known as the "negative"). Repetition speed is important because different lifting speeds produce different training effects. The faster the speed, the lower the muscle tension. Reduce your rep speed to a more controlled tempo and you increase the muscle tension. Boiled down to its pure essence, developing muscle size is a matter of high muscle tension (coupled with progressive overload, of course). The higher the tension, the more you grow. Faster reps allow you to use heavier weights, but reduce tension, so you're trading size for power and speed. This is why many Olympic lifters who lift weights explosively have mind-boggling strength, but they don't have physiques like bodybuilders. If you're ever in doubt about how fast to do your repetitions for developing muscle size, a concentric of 2-3 seconds and eccentric of 3-4 seconds is a good rule of thumb. This is a "controlled" or moderately slow rep. This two-point prescription is sufficient for a beginner, but when you reach the advanced level, it behooves you to be more particular and dissect your reps even further. Beginners often talk about rep speed only in terms of lifting and lowering the weight. But there's much more to a rep than up and down. Some strength coaches and trainers factor in the pause and write tempo with three numbers. The first number refers to the eccentric movement, the second number is the pause between eccentric and concentric and the third number is the concentric portion of the rep. Using the three point tempo prescription would look like this: 3-2-2. One way you can increase intensity and provide progressive overload without requiring super-heavy weights is by manipulating the speed or tempo at which you perform each exercise. For bodybuilding purposes, time under tension (TUT) for each set should generally be in the 30-70 second range. Sets lasting less than 30 seconds tend to develop speed, strength and power without maximal hypertrophy. Time under tension is old news in the bodybuilding and strength training world, but what many people fail to consider when planning their training programs is the impact of the stretch and contraction on the effectiveness of specific exercises. They make sweeping generalizations about tempo for all exercises, even though the resistance curve of every exercise is different. To get the highest intensity level and maximum results from every exercise requires that you analyze each exercise individually for the most efficient tempo. In some exercises, the load dissipates in the stretch position. For example, in the dumbbell side lateral raise, there's no tension or stretch when the dumbbells are at the bottom of the movement, at your sides. When the dumbbells are raised to arms length parallel to the floor, your deltoids are fully contracted. Therefore, doing isometric contractions (pausing at the top as in a gymnast's "iron cross") is an effective method in the lateral raise. It's not beneficial to pause in the bottom position, because there's no tension; you're simply resting ("cheating"). On other exercises, the tension lessens at the top of the movement (contracted position). This is true of all chest and shoulder pressing exercises where you lock out your elbows and squatting and leg pressing movements when you lock out your knees. On these exercises, tension is increased by avoiding any pause at the top of the movement. Let's look at some specific examples now. Unlike the lateral raise, it's advantageous to exaggerate the stretch on some exercises. If the maximum load stays on the muscle in the stretch position, you'll benefit from pausing in that portion of the movement. For example, in the reverse-grip (supinated) pull-down, your lats receive a tremendous stretch by the entire load of the weight stack when your arms are extended completely overhead (especially if you lean forward as you fully extend your arms). Your calves are also a stretch muscle. Research has shown that it takes a full four-second pause between the eccentric and concentric to fully dissipate the elastic energy created from the stretch-shortening cycle. However, even a one- or two-second pause in the stretch position will increase muscular tension and improve your results from a pure size-building standpoint. "Contraction" exercises are those in which the maximum tension is present at the top of the movement (in the contracted position). These are all exercises in which an extended hold in the contracted position would make the exercise more difficult, intense and result-producing. The leg extension is a good example. When your knee is fully extended at the top of the movement, the quadriceps are fully contracted with maximum resistance directly on the muscle. If you were to hold the contraction for a count of three, this would make the exercise considerably more intense. A tempo suggestion for leg extensions using contraction emphasis would be 4-0-2-3 (lower the weight in four seconds, no pause at the bottom, lift the weight in two seconds, then hold and "squeeze" at the top for three seconds). 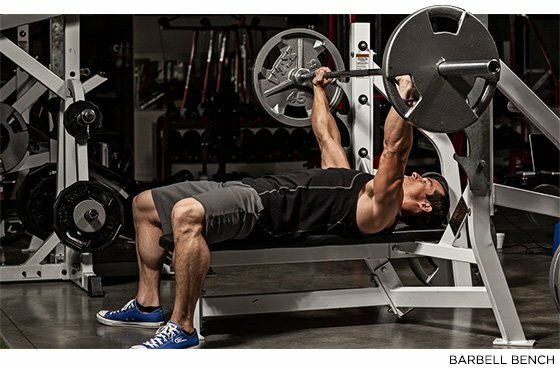 Other contraction emphasis exercises where you could use a similar tempo include dumbbell kickbacks (triceps), concentration curls (biceps), standing single leg curl machine (hamstrings), cable flyes (chest), seated cable rows (back), straight arm lateral raises, (shoulders), weighted crunches (abs). On certain exercises, you would NOT want to pause in the contracted position because the top of the movement provides the least amount of resistance. These would include standing barbell curls (biceps), squats/hack squats/leg preses (quads), dumbbell pull-overs (lats) incline sit ups (abs), and many others. Certain movements, also known as "mid-range exercises," provide little or no tension in the stretch or contracted positions. Examples include chest and shoulder presses, squats and standing curls. The maximum resistance on these exercises occurs in the middle of the range of motion. Once your elbow or knee joints are locked out, the tension is dissipated or released completely. It's beneficial on these exercises to remove the pauses. For example, if you're used to locking out on your hack squats or back squats, try a few sets without locking out or pausing between reps. A tempo suggestion for constant tension exercises is 3-0-2-0 or 4-0-3-0. Almost all strength coaches tell their athletes to accelerate on the concentric portion of an exercise. 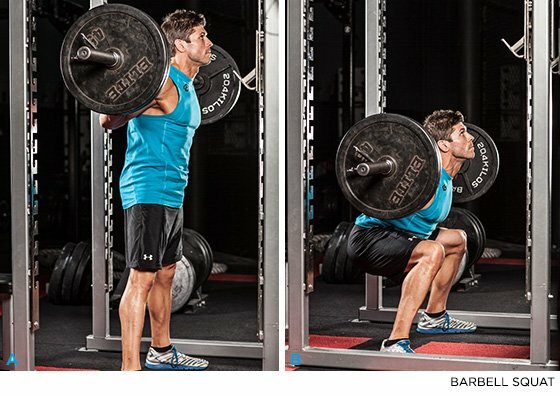 This is also a useful technique for bodybuilders at times, but bodybuilders are different from Olympic lifters, powerlifters and other athletes in that size is the goal—not speed or explosive power. The basic bodybuilding rule we've all heard is that you should lower the weight more slowly than you lift the weight. This is good advice, but rules are made to be broken. For bodybuilders, it's beneficial on some exercises to occasionally do the opposite of conventional thinking and make the concentric portion of the rep slower than the eccentric. The best exercises to use a slower concentric are those in which you have a tendency to cheat to get the weight started by bouncing at the bottom. On bench presses, for example, you can lift more weight if you literally bounce the bar off your chest and explode it up rapidly. To develop pure mass, try using less weight with a slower concentric. Better still; use a pause and a slower concentric (tempo: 3-2-4-0). As I already mentioned, slowing down the eccentric part of the rep is the classic advice of most trainers and coaches. Your natural tendency on almost any exercise will be toward allowing gravity to take over and dropping the weight. Resisting this urge and "fighting the negative" will improve your results dramatically. Many studies have proven that slowing down your eccentric (lowering) part of the rep max accelerates muscle mass as well as strength gains. It also creates more delayed onset muscle soreness. All else being equal, the set with the slower eccentric is more hypertrophy-stimulating because it eliminates momentum and increases time under tension. To increase the intensity of your workouts, experiment liberally with slow negatives of varying speeds from 4-10 seconds, and occasionally even longer. Some well known trainers claim that "super slow" or "negative only" repetitions are the "ultimate" methods for developing muscle mass. The claim that "super-slow" is the best training method is an example of erroneously overestimating the importance of a single tactic. The "best" approach is to use a variety of techniques as part of a broader strategy. 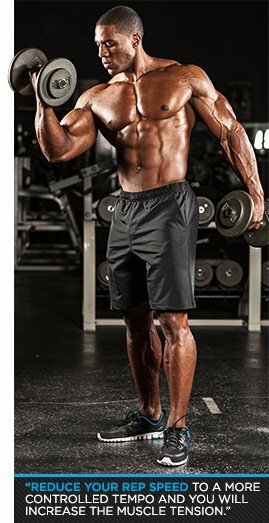 Truth be told, extremely slow reps (5 -10 seconds or longer) are a valid and result-producing technique, but that doesn't make them "the best way" or "the only way" to train. Slow reps are merely "one way." If you only used one single technique such as very slow reps, you would rapidly plateau, as the human body is remarkably adaptable. You must change your programs continually. The body will adapt to any training regimen in time, so tempo prescriptions should be varied just like any other training variable. However, by thinking through your workouts beforehand and understanding the differences in tempo and tension, you can select the single most effective tempo prescription for each exercise and use it the majority of the time. This will maximize the effectiveness of every exercise you perform—often to a level you never thought possible. Remember, tension equals muscle growth. Slow down in general, get rid of the useless pauses, add some stretch emphasis where appropriate, squeeze hard and hold on peak contraction exercises and adjust your concentric and eccentric speeds to eliminate cheating and momentum. You'll add new life to your stale old routines and see your muscle growth explode to new heights! Be sure to also check out: Creative Drop Setting—A Dozen Ways To Use Them!